Photograph by Bob Adelman. 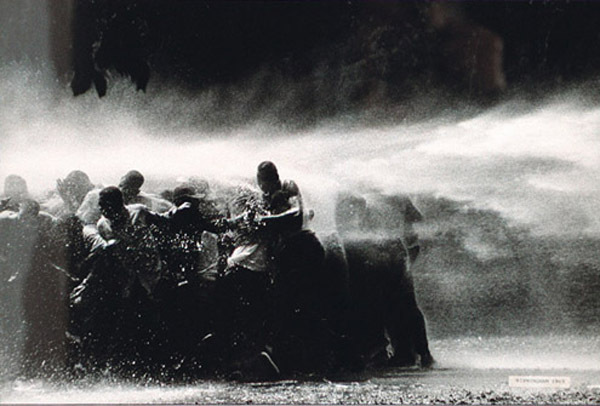 This extraordinary photograph of civil rights demonstrators in Birmingham, Alabama in 1963 being sprayed by police water hoses was taken by labor photographer Bob Adelman. Adelman's photographs are featured in KING: The Photobiography of Martin Luther King, Jr. published by Viking. and after studying one of these water-hose photographs King is quoted as saying "I'm surprised that of all that pain, some beauty came." The photo is included in our LaborArts exhibit on Union Square, in the section Labor Culture, Labor Solidarity. Photograph by Bob Adelman. Private collection. Reproduction not permitted.